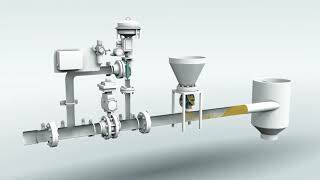 Pneumatic conveying systems transport bulk materials in a gas stream through a pipeline. Although many pneumatic conveying equipment advances have been made, costly problems – including elbow or line wear, particle attrition, rate limitation and line plugging or buildup – continue to occur. Knowing how a material behaves during pneumatic conveying allows for accurate specification of conveying mode (dilute or dense phase), gas flow and solids loading, and type of gas mover (for example blower, fan or compressor). This Technology Zone offers an insight into the latest innovations in pneumatic conveying system design. Process equipment manufacturer Gericke, USA, Somerset, NJ, has unveiled the Pulse-Flow(TM) PTA dense phase pneumatic conveying system. SALINA – Coperion K-Tron supplies a wide range of positive displacement (PD) continuous vacuum, pressure, and vacuum/pressure system blower packages for conveying bulk materials. Packages are available for 2 to 10 inch conveying systems. At Schenck Process we understand that efficient, high volume of material handling, using processes that consume minimal cost and energy, is an important on-going consideration for our customers. Therefore after 40 years of leading innovation in Dense Phase Pneumatic Conveying, we have proudly evolved our solutions further, to provide just that. Schenck Process E-finity® is a patented continuous dense phase convey system for fragile materials. Precise pressure monitoring and airflow corrections allow the system to operate efficiently under all conditions, while gently inducing materials through the convey line in slug form. Blo-Tech Ltd. specialise in pneumatic conveying and mechanical handling systems for the bulk material handling industry. We have recently designed and manufactured a bespoke 8 m³ batch hopper for a pharmaceutical client that utilises both a lean and medium phase vacuum conveying system to fill and then discharge the batch hopper. A craft brewery needed to regularly add hop pellets or malt into their 20-30 foot high kettles during the beer-making process.